We are excited about our January sale #320 for many reasons. At the top of our list of great properties is a wonderful collection of Greece most of which is unused NH in blocks or sheets. Most of these stamps are in exceptional condition, chosen for centering and color! Greece C8-14 are in sheets, a real showpiece, possibly unique! We also have a strong section of covers including U.S. #1s (5). We have many accumulations and collections with U.S, worldwide (FDCs of both), air, naval, space and more. Our U.S. section includes many nice individual places plus a very strong group of accumulations and collections. 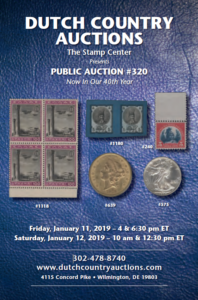 Among the worldwide lots are many attractive singles and sets, country collections, accumulations and large lots. We hope you find something that fits your collecting interests.